Calling all Creekview Dads! Come have some wonderful treats with your child and visit the bookfair this Wednesday! Stop in for “Desserts with Dad” on Wednesday evening, have “Lunch with a Grand One” for lunchtime company and book buying on Thurs. or Fri., and/or send in money for your child to purchase some great books throughout the week! Boost your Box Top count with the HEB Box Top special! Help boost your child’s class Box Top count! HEB is running a promo from NOW until September 20th. If you purchase 10 items with Box Tops on them, you get 60 bonus box tops. If you purchase 15 items with Box Tops on them, you get 100 bonus box tops ! SPIRIT NIGHT IS TOMORROW, TUESDAY 9/6! Grab lunch or dinner at Crust and then yummy sweet treats at Jordan’s Sweet Shoppe. 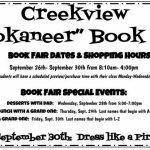 Be sure to mention Creekview, so a percentage of the sales can go back to our school! Gear up for college football game day by wearing your team shirts tomorrow!